Investors seeking lawful permanent residence status through the EB-5 program must make a $1,000,000 investment into a new commercial enterprise. However, if the investment or the project is located in a “Targeted Employment Area” or “TEA,” the investor need only invest $500,000. A TEA is defined by federal regulations as a rural or economically distressed area that has experienced an unemployment rate of at least a 150% of the national average. The unemployment data used in a TEA designation can be based on state, county, city or census tract data. A “rural area” is defined as any area outside of a metropolitan statistical area or a city or town with a population of 20,000 or more. When is a TEA determined? TEA designations are based on the most recent annual labor market statistics, usually released by the Department of Labor in the first quarter of each calendar year. Thus, TEA determinations are generally valid for one year. Whether the investment qualifies as being in a TEA is determined by whether the area was a designated TEA either upon the date of filing the I-526 Petition or the date of investment, whichever is earlier. If something is designated a TEA one year, is it automatically a TEA the next year? No, remaining a TEA is dependent upon unemployment data in the area in which the regional center resides. A regional center may be designated in a TEA one year, but if unemployment decreases, the project may no longer be considered in a TEA. What can you do to make sure that you are investing in an authorized TEA? Ensure that you have the most current TEA designation letter; if the letter is more than a year old, make sure to ask for an updated letter from the appropriate agency or project prior to filing the I-526. Is there a uniform process by which TEAs are granted? No, there is no set process. USCIS has said it defers to the states to establish a process to grant TEA designations. Thus, each state is different. Some states may have an agency issue a TEA certification letter; in other states, local officials will be granted authority to designate areas as TEAs. How can I, as an investor, determine if a project is located in a TEA? The American Fact Finder run by the Census Bureau allows individuals to enter a street address to determine if the project is in a rural location by reviewing the population of that city or town. You can also review another Census Bureau website which provides maps of metropolitan statistical areas (MSAs) by each state. 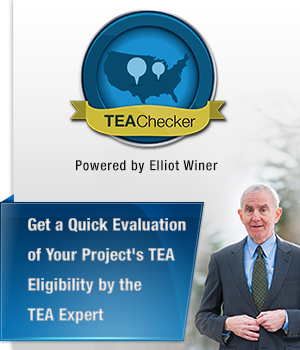 You can use these resources to see if the project or investment meets the criteria for a TEA outlined above.